Is it strange that I am fascinated with how people pack their diaper bags? I have no idea why it's so interesting to me but it totally is. Maybe because I know just how challenging it is to get out of the house with a baby and I'm in awe of how other mothers manage it. I wanted to write this post when Pier was an infant, but I wasn't confident in my diaper-bag-packing abilities then. New mama Emily was usually a hot mess that forgot the majority of the useful things (but somehow remembered to pack a baby hat in 80 degree weather?). I'm still a hot mess but I like to think I'm a hot mess with a few more years of experience. And as a result, I write these posts because I care about you new mamas and want you to learn from my mistakes. Plus it's just fun. Like other areas in my life, I try to keep the contents of my bag simple. But life with a baby and a toddler is never really simple. You can't keep your diaper bag too bare bones because of the "expect the unexpected" factor that children bring (you just know that blow-out-onesie-ruining-diaper is going to happen at the most inconvenient time). Let's just say I've had my fair share of horror stories during Pier's infant days. My secret for maintaining a simplified diaper bag? I designate 3 separate zipper pouches to distinguish between my stuff vs. kids stuff. I find this one trick keeps me sane and organized. I was gifted Pier's zipped up pouch but HERE'S the one I use for Eulalie and THIS is the one I use for myself. Side note: Does it make me high maitenence if my list is longer than the kids?! Once those things are taken care of, then I have the rest of my necessities free to roam around the bag as they please. You'll notice I don't have any wipes in the kids bags...that's because they are probably my most frequently used item and must be easy to access at all times. I usually keep a full sized (aka non-travel) pack of THESE around. My other must have items are a NURSING COVER, DIAPER CHANGING MAT, and my WATER BOTTLE that usually gets confiscated by a certain two year old. And I'll have my SOLLY BABY WRAP or WILDBIRD RING SLING tucked away during the fourth trimester period. I'll also sneak THIS in my bag if we're going out to eat with the kids...it's perfect if I we need to hold his attention for an extended amount of time. My diaper bag is the convertible day bag from NENA & CO. and I love it so much (and get compliments galore whenever I wear it out!). Like all baby-related items, you're going to have personal preferences as to what works for you. I've just accepted that the three magic words of parenthood are trial-and-error -- a mantra that even can be referenced to a bag for your kids diapers. It's my personal opinion that backpack diaper bags are crucial. I did the non-backpack thing for a while and quickly realized I'm not an over-the-shoulder-bag kinda mama. 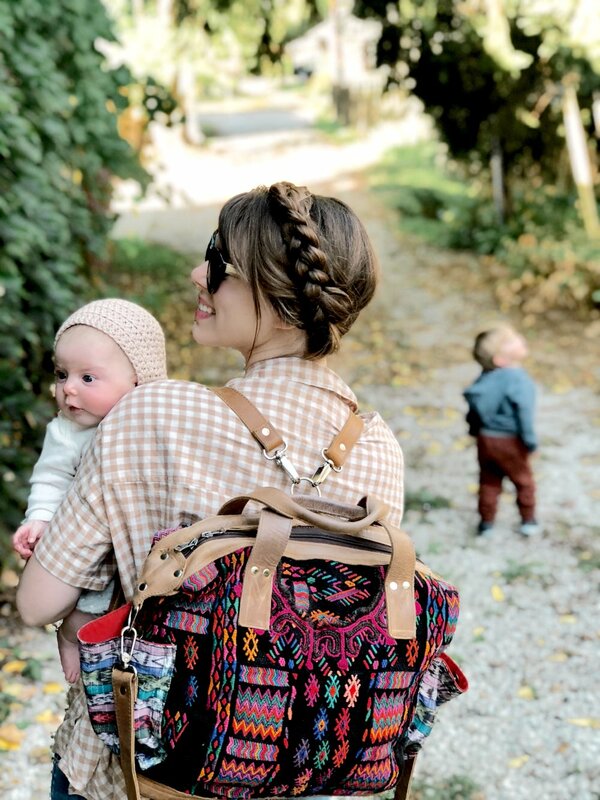 What are your diaper bag must-haves? Any tips and secrets you'd like to share with this newby mama of two are welcome!